12oz can from a sixer purchased at a local grocery store for around $9. 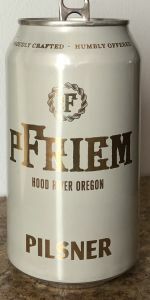 Canned on March 1, 2019, which makes it fairly close to the first batch, as pFriem only began canning in February. Sadly, one can was ruptured while I was removing it from the plastic 6-pack holder, and I was treated to the novel, yet tragic sight of watching beer rush out of a can while the tab remained in place. Perhaps the canning line still needs some work, as I was not.using much force. Anyway, I christened my new Evil Czech Brewing mug (thanks again, Mike!) with one. Poured a clear, yellowish gold.color, with a nice, moderate-sized white head. Grassy, herbal, and slightly astringently citrusy in the nose. There's also a crackery maltiness, but not surprisingly, for a PNW beer, the hops jump out at you. It's a style-appropriate hoppiness, though. Kinda reminds me of my favorite German pils, Jever. Taste is pretty similar to the smell. Herbal and lemony hoppiness in the foreground, with a crackery malt backbone, finishing dry and crisp. Nice tasting pils! Light but crisp mouthfeel, textbook for the style. This is an excellent pilsener that leans towards the hoppier end of the style while crucially not going beyond it, and keeps things light and crisp. This may become my standard fridge beer this summer, it's so good. Excellent Pilsner. Clear, great foamy head, got some funk on the nose, perfect taste for the style, crisp, clean, easy drinking. I would easily kill a six pack of this on a hot summer day. Thanks @Lingenbrau, for the “I just threw this one in with the rest of the box” beer. 12 ounce can, dated 2/ something. It was smudged. golden yellow, tightly bubbled finger of head. Heavy whisps of lacing and a few streams of tiny bubbles. This is how I picture a Pilsner. Delicate nose of fresh hay, lemon, crackers, hint of sweetness. Lemon comes thru first on the taste, lemon peel, crackers, bit of doughiness, spicy finish. A lovely beer that would be a staple if available to me. Pale gold, sharp and clear. Fine carbonation, strings of tiny bubbles steam up the glass and support a steady head. Nose is light bready, beer-y. Take a sip and you're in for a treat. Clean taste of malt, with the right type of bitterness to make for a very refreshing beer. Perfect for a warm summer afternoon, or for a Christmas eve preparing dinner -- as we are doing! I’m not a Pilsner guy but I had a Pilsner drinker visiting and we picked this up. I can’t imagine a better Pilsner. Well balanced, perfect flavor, and somehow the mouth feel is substantial yet light. If I ever need a go to Pilsner, this will be it. Picked this up on a recent trip to Oregon. Aroma is grain, grass, touch of floral. Beautiful clear yellow with rising bubbles and a tall, white, creamy, bubbly head in my footed pilsner glass. The glass shows off this beer wonderfully. Taste is bread, floral, touch of spice. Some bitterness in the middle and finish. Wonderful. Too bad I can't get this beer regularly. Feel is moderate with nice carbonation on the tongue. After several sips, the head is still tall and thick, leaving nice looking lacing down the glass. Absolutely top-notch German pilsner. PS: The head lasted until nearly the end.